It's been a while since I've gotten a Cosrx review up, and I finally feel like I'm settling into our home enough (6 months later) to sit down and start focusing on the blog again. 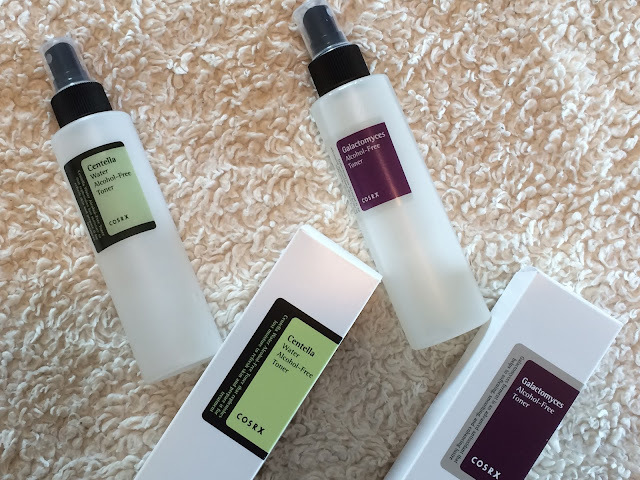 I've talked about the Cosrx AHA/BHA Clarifying Treatment Toner in the past, but today I'd like to discuss the two other toner options currently available from Cosrx. 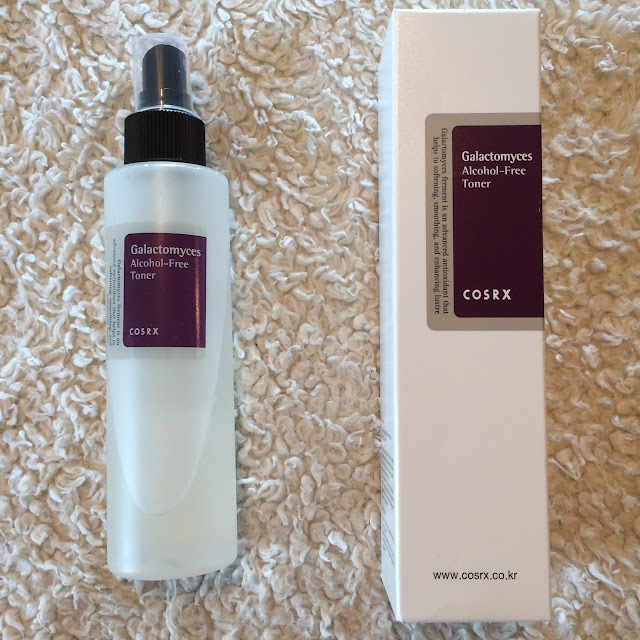 In this post, I'm going to introduce you to the Cosrx Centella Water Alcohol-Free Toner and the Galactomyces Alcohol-Free Toner. I'll discuss the similarities and differences between each product, why I think they may or may not be useful to you, and where you can find them if you wish to try them for yourself. The Cosrx Centella Water Alcohol-Free Toner contains 10% Centella Asiatica Leaf Water which is an antioxidant that helps calm irritation as well as heal the skin from acne and signs of aging by increasing blood circulation. 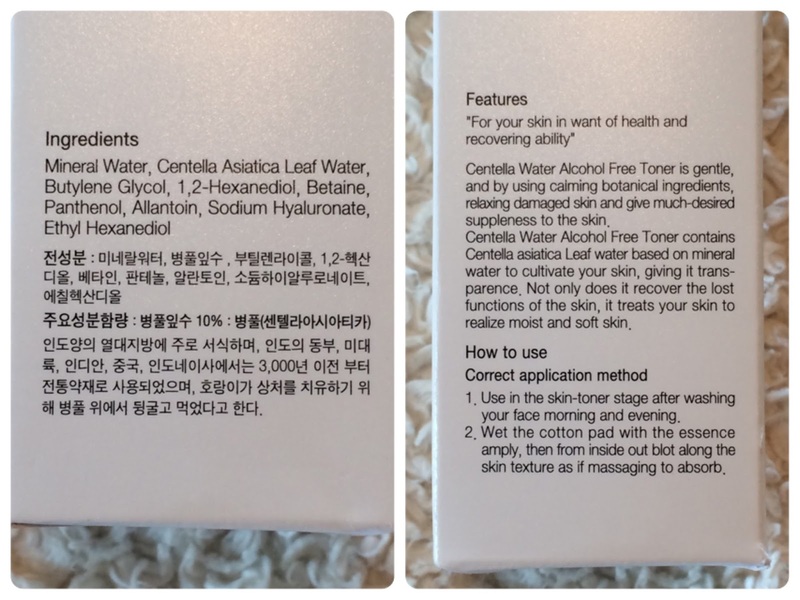 This toner also contains mineral water and sodium hyaluronate (aka. hyaluronic acid) to hydrate the skin. 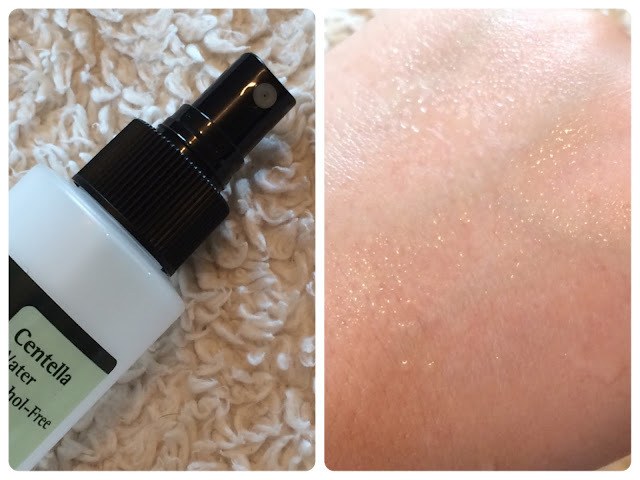 This toner comes in a bottle with a spray top, to eliminate pouring too much or spilling product. It is odorless, clear, and feels like water against the skin. 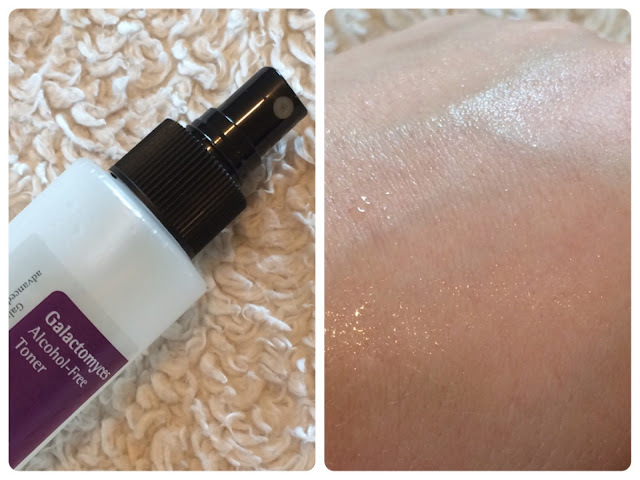 While this is a hydrating toner, it has a lower mid-range pH of 6. Ingredients: Mineral Water, Centella Asiatica Leaf Water, Butylene Glycol, 1,2-Hexanediol, Betaine, Panthenol, Allantoin, Sodium Hyaluronate, Ethyl Hexanediol. 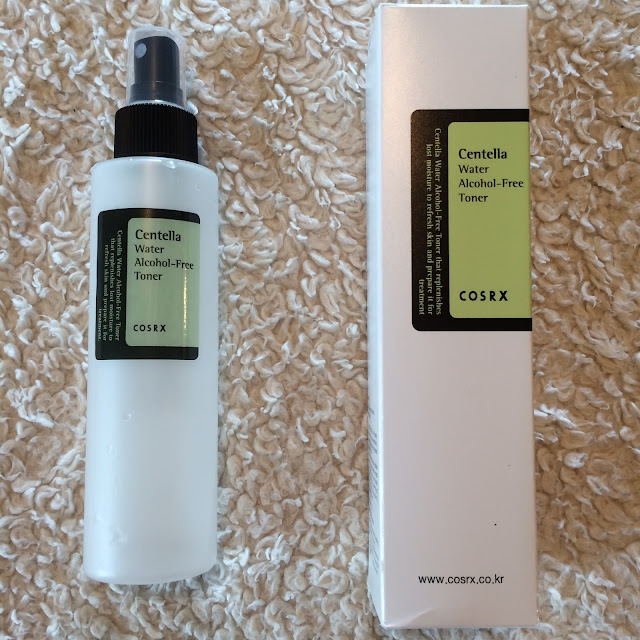 You can find the Cosrx Centella Water Alcohol-Free Toner at Cupidrop, Jolse, Amazon, and MelodyCosme. The Cosrx Galactomyces Alcohol-Free Toner contains 10% Galactomyces Ferment Filtrate which is fermented yeast that helps slow and in some cases even reverse signs of aging, as well as helping prepare your skin to better absorb hydrating layers applied afterwards. 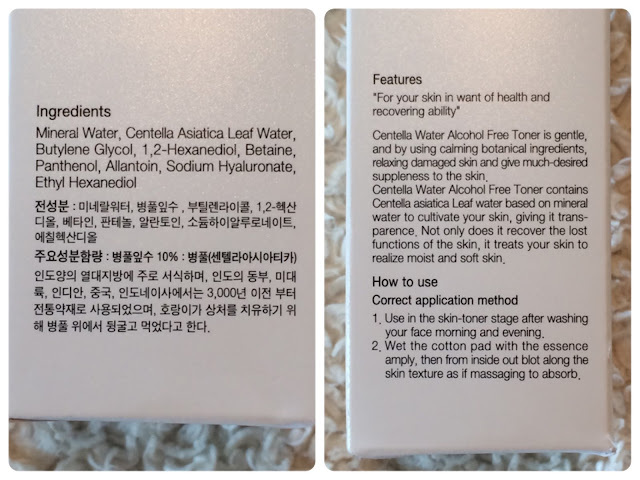 This toner also contains mineral water and sodium hyaluronate (aka. hyaluronic acid) to hydrate the skin. This toner comes in a bottle with a spray top, to eliminate pouring too much or spilling product. It is odorless, clear, and feels like water against the skin. As with the Centella toner, this one also has a lower mid-range pH of 6. Ingredients: Mineral Water, Galactomyces Ferment Filtrate, Butylene Glycol, 1,2-Hexanediol, Betaine, Panthenol, Allantoin, Sodium Hyaluronate, Cassia Obtusifolia Seed Extract, Ethyl Hexanediol. You can find the Cosrx Galactomyces Alcohol-Free Toner at Cupidrop, Jolse, Amazon, and MelodyCosme. As you can see, both toners are actually quite similar and even the ingredients themselves only offer a couple minute differences. Personally I find these two toners a lot more gentle than the Cosrx AHA/BHA Clarifying Treatment Toner, which I hear a lot of complaints about. I think the higher pH level, combined with the absence of acids, makes either of these toner a suitable option for any skin type. 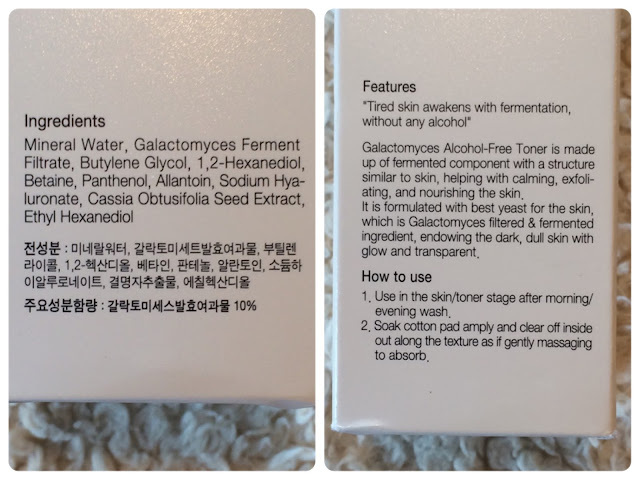 Both seem to target the same types of issues, but the Galactomyces seems a bit more suitable for drier, dull, or more mature skin types, while the Centella would be a great option for those with sensitive or acne-prone skin. Both offer a hydrating and smooth finish, however, and will help prep your skin for the remainder of your routine. What a great review! I love that both of these are hydrating!